I’m a DIY-newbie. I’ve put up a picture and curtain rail but that’s about it, so I’m looking for some advice about a DIY activity I’d like to do. I would like to hang a heavy boxing bag in my house. I don’t want to hang it outside, and the only inside option is the garage. There aren’t any decent looking roof beams, and it’s a flat roof, so I figure the best solution is to fix it from a wall bracket. The wall I am thinking of attaching it to is a single thickness brick wall. Rather than fixing this directly to the wall, I thought it might be best to fix some wooden batons to the wall first and then screw the bracket to that. I thought a 1” (deep) by 2’ (wide) baton horizontally fixed to the wall with 4 x ??? masonry screws would do for the top two fixtures for the wall bracket. For the bottom two screws, I was thinking of a square of wood: 1” (deep) and 1’ x 1’ (wide/high) again with 4 x ??? masonry screws. I’d then fix the bracket to the wall, with screws long enough to go through the wood, and into the brick. a)	Is this a stupid idea from the offset? If it sounds reasonable what size screw would be best for the wood fixing and are the wood dimensions reasonable? c)	What size screw should I use to screw the actual bracket in? The other side of the garage has a wall that it shares with the kitchen (so it's overall thicker), but it looks a hodge-podge of differently orientated bricks and breeze-blocks – hence why I’m thinking of avoiding that wall. 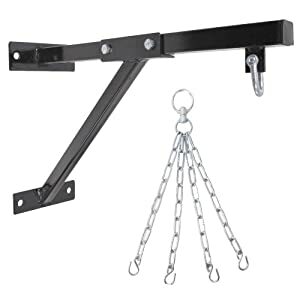 This might sound a little overkill, but personally, I would look at hanging it from the ceiling, even if it meant taking a small strip of ceiling down and inserting a small steel joist across the 2 walls..
Doesnt have to be anything major, but what would worry me is not just hanging the 30kg bag from the bracket, but the fact that the bag would be constantly moving around and taking impacts, which resonate back through the bracket and fixings. Without knowing the strength of the wall and its structural integrity its hard for anybody to guess..
Might even be worth phoning a surveyor and just asking the general question of what sot of weight is typically safe to hang from a single brick garage wall..
You have probably sorted this I imagine but if it helps anyone reading this now, I have recently fixed a similar bag bracket to an exterior wall and sought the advice of my fixings specialist on how to do it. I ended up using 10mm diameter hex-head coach screws with heavy duty wall plugs into the brickwork. Six months in and can report no visible problems! No movement in the bracket/fixings. Probably I'm not hitting the bag hard enough..